One year at Lil O's former Montessori school, I was the coordinator of school spirit, which really meant making the teachers and staff feel appreciated. I was soooo happy to have that job. I loved coming up with "gift packs" for each teacher and staff member with my $20 budget for each (paid by the Parent Association). I surveyed all the teachers and staff at the beginning of the school year to find out their interests and favorites - favorite colors, Starbucks drink, style of home decor, music, etc. You can kind of see in the photo above the "gift packs" I would put together. I needed to blur the image a bunch to keep the names semi-private. This is the Internet after all, right? Box of favorite tea. I found Trader Joe's and Target had the best prices. Beaded necklace I would create in their favorite color. I have quite a collection of beads, so I literally didn't need to buy any supplies for this; I already had them! Framed photo of students. I found great deals on frames at Joanns, Michaels and Home Goods. CD with favorite music and a recording of the children singing Happy Birthday to them, I used the "Voice Memos" app on my iPhone to record this. Card with messages from all the families* and all the children's signatures. I think kids' signatures are priceless. Framed Wordle created with words that described the teacher or staff member*. 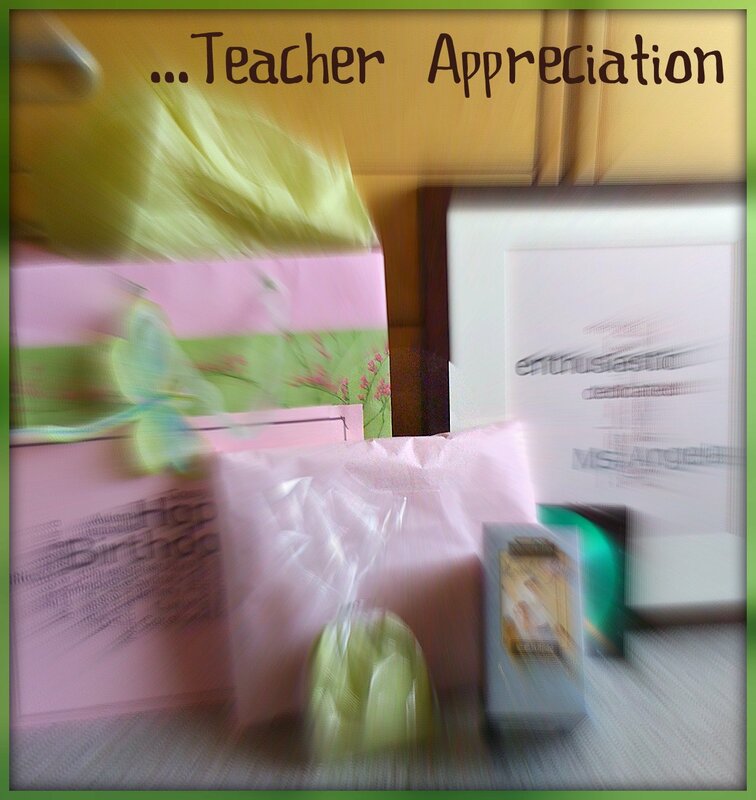 From what I understand, the teacher appreciation gift packs were a bit hit. I know the teachers and staff thanked me a lot. Educators and school staff sometimes are under-recognized for the amazing love and nurturing they provide to students. Have you shown your appreciation to an educator or ally lately? * In order to efficiently gather parents and families' birthday messages and descriptive words for the Wordle, I used the free Survey Monkey and made a survey with two questions: 1) Describe the teacher in 3-5 words, and 2) What is your birthday message for Mr./Ms. XYZ? Then, I emailed the survey link to all the parents and families and set a deadline to complete it. Once completed, I simply copied and pasted their responses into a Word document or the Wordle template. It was easy peasy that way.